April 24, 2017 – Madison. Today the Cities of Madison and Middleton announced the launch of the MadiSUN Solar Group Buy program, a collaborative program that helps residents easily and affordably invest in solar electric systems on their homes. The announcement continues the steady stream of renewable energy commitments and solar projects announced in Wisconsin, and follows 2016’s successful solar group buy program—the largest in Wisconsin to date. 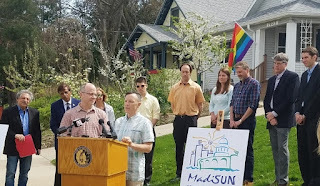 The MadiSUN Solar Group Buy program will enable Madison and Middleton residents to “go solar” together. Through the group buy program, a team of community members requests offers from solar companies across the region. The program then pre-qualifies a price and service provider to make it as easy as possible for people to join the program. The City’s investment in marketing and competitive bidding will drive down the cost for each participant. The cost of installing solar has never been lower, and households can receive a Federal Tax Credit for 30 percent of the system cost, while Wisconsin’s Focus on Energy program offers up to $2,000 in additional rebates. The program, through its contractor RENEW Wisconsin, has begun recruiting interested households to participate. This summer, citizens can learn more and sign up at madisunsolar.com. 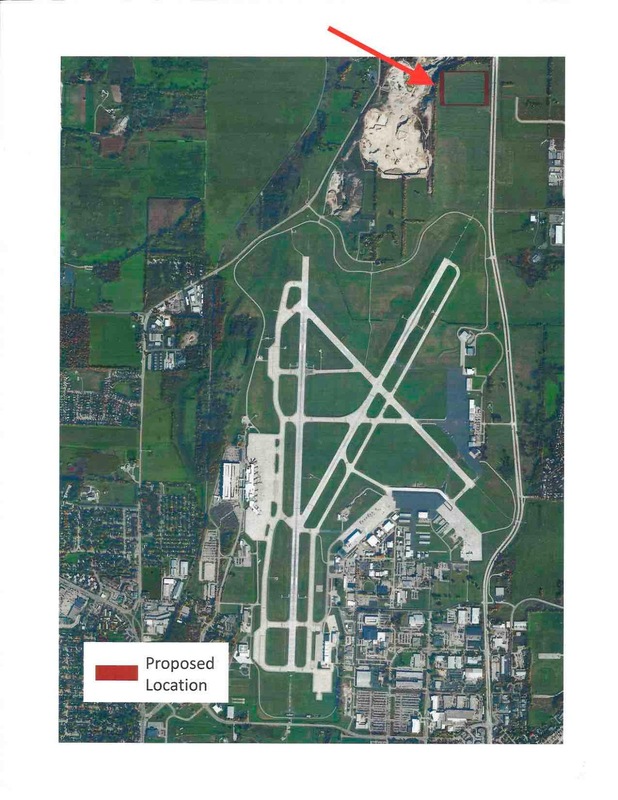 Madison Mayor Paul Soglin lauded the group buy program. 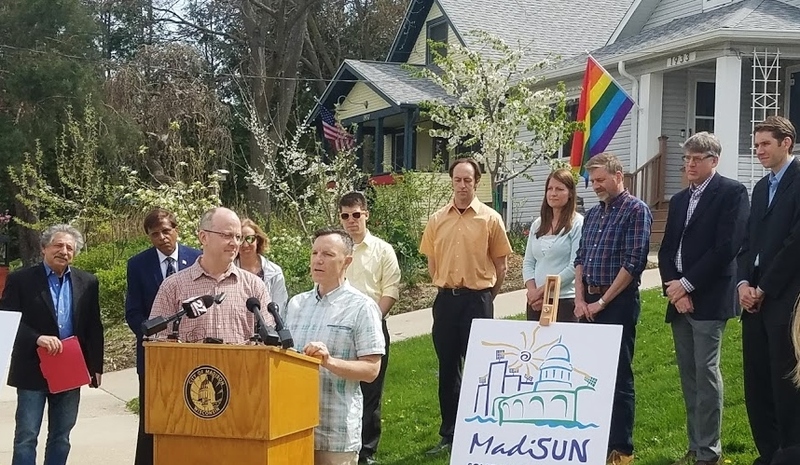 “These programs are proven vehicles for making rooftop solar more accessible and affordable for homeowners in the community, and that’s why we thank MadiSUN,” he said. 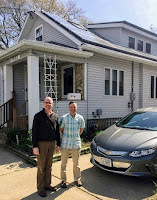 The City will partner Summit Credit Union to offer a special Solar Energy Loan Program where residents can finance 100 percent of a solar electric system with no fees or collateral. 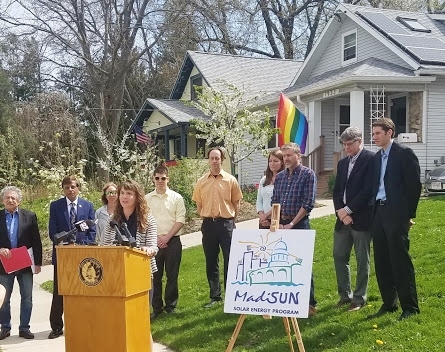 “Summit Credit Union is thrilled to continue partnering with the City of Madison bringing solar technology to the area,” they said in a statement. Details on the MadiSUN loan program can be found on the website summitcreditunion.com or by calling 800-236-0985. Six educational events were also announced as part of the program, aimed at helping residents learn more about solar energy and the options available for installing solar. All events are free and open to the public. The dates, times, and locations information sessions are available at www.madisunsolar.com/upcoming-events. 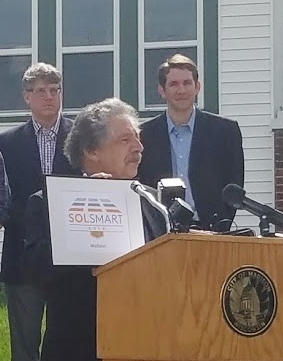 Madison earned a “gold” designation from SolSmart, the highest level of recognition from a national program under the U.S. Department of Energy’s SunShot Initiative. The “gold” designation recognizes the city’s efforts to accelerate solar development, from improving permitting and zoning for solar, to investing in financing and solar workforce training programs. 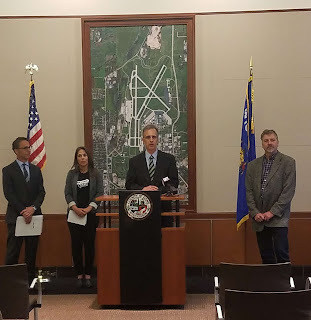 Madison recently became the first community in Wisconsin to commit to a goal of 100 percent renewable energy. The City is already progressing toward that goal, including initiatives like a citywide solar apprenticeship program whose trainees will install another 100 kilowatts of solar on city facilities. Middleton Mayor Gurdip Brar pointed to the city’s many solar developments in recent months, such as the 100kW atop the Middleton Police Station. 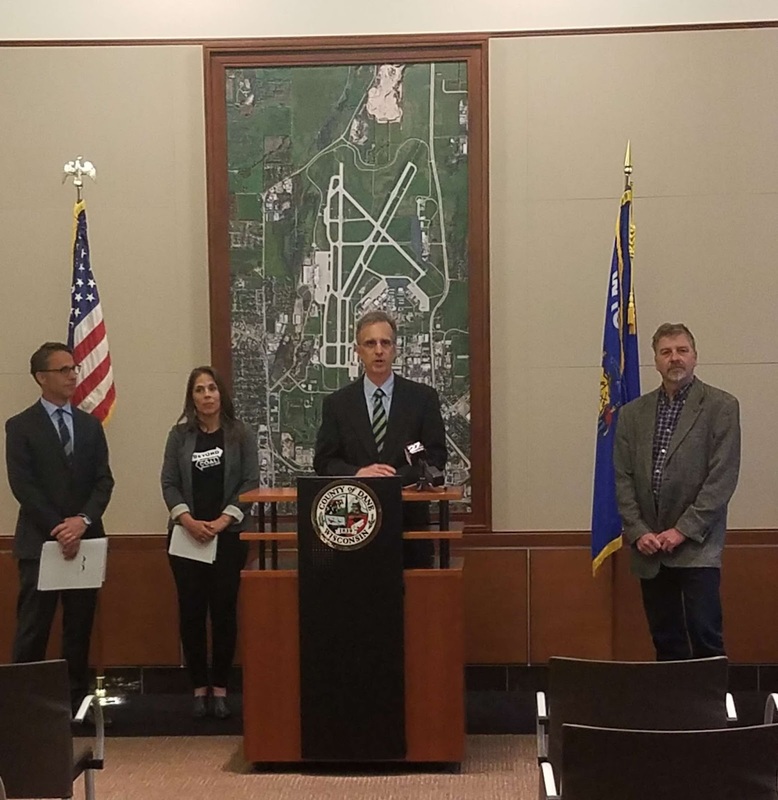 “We at the City of Middleton are proud to work with our neighbors to bring the benefits of solar energy to all of our communities here,” he said. “Going forward, Middleton and Madison are going to be cooperating a lot more,” he said. to power their hybrid-electric car. Homeowners Josh Feyen and Jay Edgar hosted the event outside their home, where they installed 6 kW of solar panels in 2016 as part of that year’s MadiSUN Group Buy program. The array also powers their new car, a hybrid-electric Chevrolet Volt. Feyen estimates that the system will pay for itself through energy cost savings in about 10 years “and then we’re going to be getting about 20 years of free electricity, including charging our car three times per week. So if you think about it, we’re saving a lot of money from the energy we’re creating and the gasoline we’re not putting in our car,” said Feyen. They were also able to take advantage of the federal tax credit and rebates from the Focus on Energy program. Feyen and Edgar have also been talking to family and friends about the benefits of the MadiSUN program. “We’ve kind of been Johnny Appleseed,” Edgar says. gives concluding remarks at the 2017 launch. Sign up to learn more about the program at https://madisunsolar.com.